This post has been a long time coming. I did my research for it over 3 months ago! But school really kept me busy. I am now failing hard my trig and chem classes. Normally the Noonday Demon would use this to torment me, but since i have chosen a different path it hasn’t bugged me that much (though the Demon does have other aspects of my psyche to stay occupied with). Enough time has passed. It’s high time i got around to talking about a very unique fossil sight here on the Central Coast. In paleontology you have to be able to deal with disappointments. You may not always find exciting or important fossils every time. You may encounter accidents or mishaps during excavation, transport, and/or preparation. Or your grant proposal may have been rejected. I got a taste of such disappointment this weekend but not without a good amount of frustration along with it. Now in my quest to open my own museum i have begun collecting fossils. I already have a nice little collection of invertebrates (with a few vertebrate fossils). To aid me i bought a book about a month and a half ago. The book is Gem Trails of Southern California by James Mitchell. I had hoped that maybe there were a few places to look for fossils in the book. And indeed there were, quite a few even. But not all is right in this rock hound’s guide. I have never written a review on Amazon but i feel compelled to make this book my first. And here is why. Saturday i went out to Hart Park in Bakersfield over in Kern County to look for fossils at one of the book’s sites. The site is called Ant Hill (at least by the book). It starts off by talking about Sharktooth Hill and how collecting there is no longer possible there. The book gave directions how to get there. I had a little trouble as i couldn’t find the road to get off on. The book was written in 2003, so the directions may have just been out of date. And indeed they were. I guess the road i was supposed to take had been converted into a bike path. But this wasn’t a problem. It just meant i had to make a short hike to the site instead of driving there. 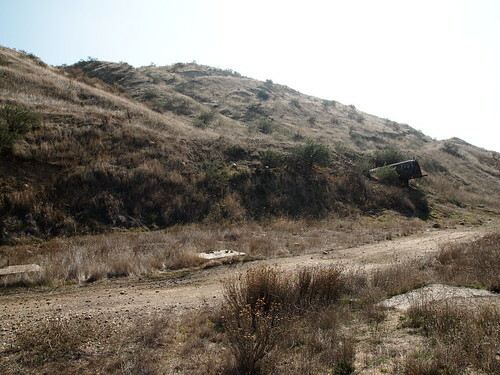 The site was easy to find, considering it has an old rusted bunker sticking out of the hillside. 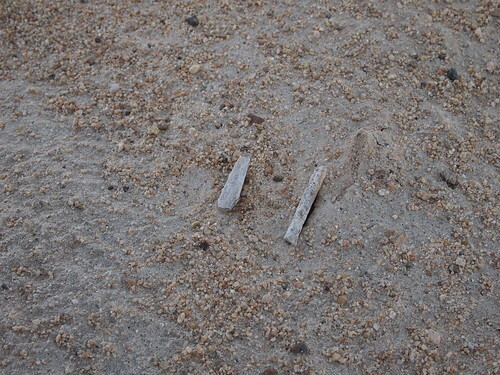 The book said that shark teeth and even bones could be found at the site. Naturally, this got me excited. Now that i had found the site, it was time to start looking for fossils. I was ready to go: I had my rock hammer, some hand tools, my dig knife, a paint brush, and bags. But i didn’t find anything. 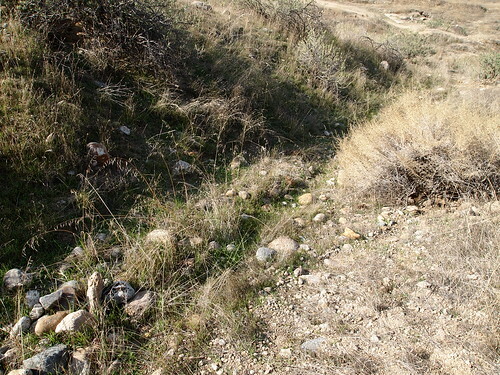 I spent an hour and a half combing the hillside, eyes to the ground, only to turn up nothing but rocks. No fossils in sight, not one scrap of bone. Why? Could it be that i didn’t find any because I’m just an amateur? Possibly, but i think the book is to blame here. The prime collecting is easy to see, being situated on the hill side, above the bunker. 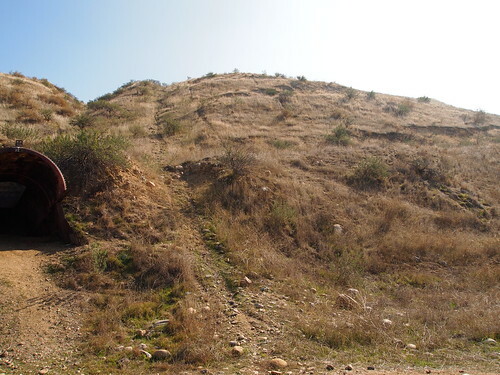 There is a continous linear series of excavations along the somewhat thin, fossil-bearing strata made by previous collectors, which marks where you should start. Ok, where are the excavations? Are they those terraces with the trails on them? See the terraces? If those are excavations, those were big excavations. Like, beyond the scale of the average hobby collector. Or are they those ditches running down the hill side? this is especially hard for me given my learning disability because i’m not so strong with visuals. The book doesn’t go into any detail about the nature of these excavations. Nor does it go into any detail about the fossil layer. Where exactly on the hill is it? In the middle? Just above the bunker? Is it on the left or the right side? What is the nature of the fossil layer? Is it a silt stone, a sandstone, or a mudstone? It is gray or light brown? The book doesn’t explain! It just says “the hillside above the bunker”. Well i searched the hillside above the bunker and i found nothing. 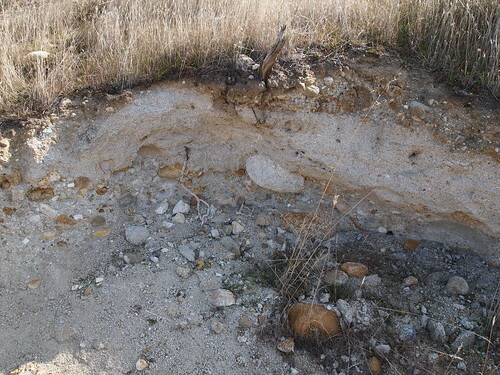 Not only did i not find any fossils, i couldn’t even find what could be a suitable fossil bearing deposit. 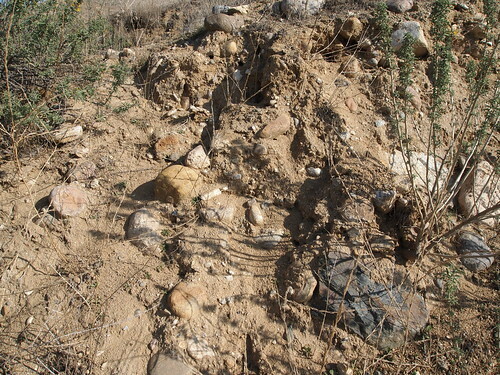 All i found in the outcrops (as well as the hill at large) was unconsolidated sand filled with rocks. I had learned from books, websites, and museums that conglomerates are not good places to find fossils because the rocks would have broken up the remains. I mean seriously, just look at them all! Bakersfield is a 2 hour drive for me, so it was a long way to go for a bust*. I found nothing no thanks to this books lack of details. This lies in stark contrast to a couple other sites i visited from the book (i’ll discuss them in detail in future posts). One was Jalama Beach in Santa Barbara County. The book mentioned that in addition to rocks, fossils of fish, plants, and even “petrified whale bones” were found there. Well the shale was the right strata (the Monterey formation) but the shale was so crumbly and weak that i doubt any fossils could be inside. It said the cliffs just east of the beach was where to look. I found the cliffs, and a seaweed fossil, but the book could have easily said “he cliffs just east of the beach along Jalama Beach Road”. And the whale bones? Not one word on where people found them. It just said “and even petrified whale bones” at the end of it’s list of stuff to find at the beach. Were these bones found on the north end or the south end of the beach? Do the bones stick out of the cliffs or are they encased in concretions? Explain book. Explain! Much of what can be gathered there is just chips and pieces, but there are complete specimens, if you are willing to spend a little time doing some LIGHT digging. Bottom line is, this book needs a major rewrite! I mean, the directions to the sites are decent enough and the book has given me some new places to look. But for the love of Great Atheismo, it doesn’t elaborate on some very important details. Each site gets 2 pages, one with directions and the other with the map. One page just isn’t enough. If the book wants to cater to the casual and amateur rock hound, it needs to elaborate on specific details that don’t take a minor geology degree to spot. It’s a handy little guide but because of it’s vague descriptions, i made a day trip for nothing. Long time. Same excuse. Been very very busy the last few weeks. Going to Halloween Horror Nights at Universal Studios, Seeing the new Hall of Life at the Raymond Alf Museum, visiting my sister in Pasadena after her horrible accident, having to ride my dad’s bike/take the bus because the transmission on my Ghettomobile (aka 1993 Geo Prizm) died, and just fighting with my depression as usual. But one thing out of the busy mess was the Natural history Museum of Los Angeles County’s annual field trip to Red Rock Canyon State Park out in the Mojave Desert. You may recall my discussion on my first time last year. Well no need to talk about all that again, so here is my coverage of this year. All in all, it was a very good time. I hope i will be able to go next year. Now to get to work on some long over due posts. At the end of the spring semester this year my geology teacher recommended something to me. 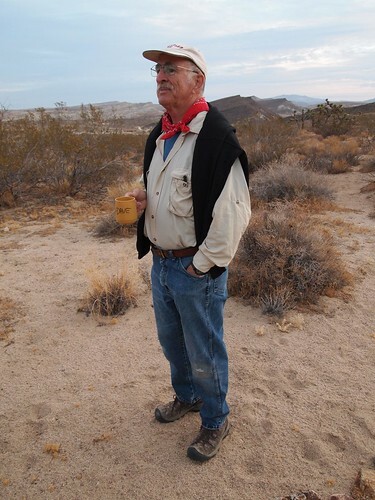 He said that the Natural History Museum of Los Angeles County had a trip where you could go out to Red Rock Canyon State Park in the Mojave Desert and look for fossils. Seeing as I am ever so anxious to get out into the field and look for fossils, I jumped at the opportunity. I looked it up on the internet, marked my calendar for the day I could register, and waited patiently for that day. Once that was achieved it was another couple of months before I would actually get to go. But before I ramble on about this trip, I think a little background is in order. Red Rock Canyon lies in the Mojave Desert about 2 hours east of Bakersfield. Paleontologists in the early 20th century discovered that the bright colored crags and shrubby sands harbored a detailed record of a lost world. Named the Dove Spring Formation, the geologic unit spans the late Clarendonian to early Hemphillian (12 to 8 million years ago). 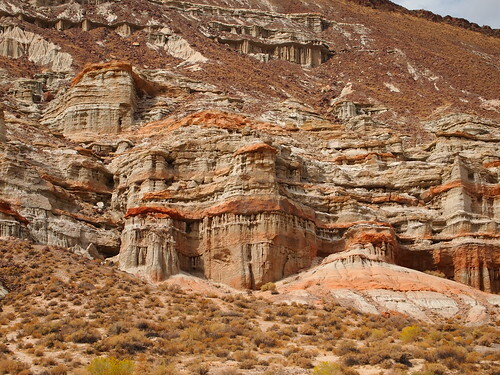 During this time Red Rock canyon was further south than today, having been pulled north by the San Andreas Fault. Nearby volcanoes occasionally blanketed the area with ash, helping to preserve (and in the future date) this ancient environment. And what of the environment? 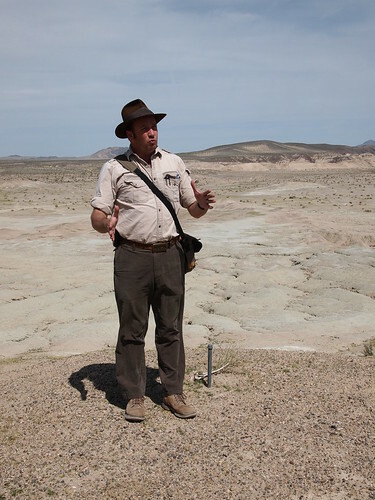 Fossil plants, wood, and pollen have helped paint a picture that reveals the Mojave Desert was very different millions of years ago. The landscape was laced with rivers and ponds from which patches of woodland sprang. Vast swaths of grass grew between them. The climate was sub tropical, as revealed by the presence of certain plants like acacia and magnolia trees. 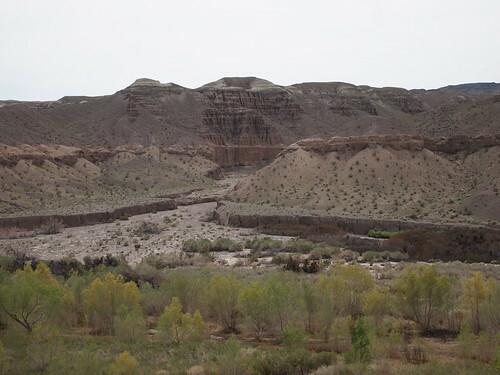 The area was an elevated basin believed to be as much as 9,000 feet above sea level. Millions of years of erosion (which helped to create the park’s spectacular geology) wore it away to its current elevation. The formation has yielded an abundance of fossils camels, five species thus far, ranging in size from a gazelle to a giraffe. Four species of pronghorns, smaller than today’s variety, have also been fairly prolific. A species of peccary and a late species of oreodont help round out the artiodactyl fauna. Horses are also common, with both functionally three-toed and functionally one toed varieties known. At least two species of rhinos and the ever present Gomphotherium represent the heavy weights of the assemblage amidst a profusion of micro critters. This abundant diversity of herbivores was stalked by a variety of carnivores. Perhaps the top predator in the area was the big bear dog Ischyrocyon (Nimravides might have been at the top, but determining if it was in the area is a work in progress). The nimravid Barbourofelis witfordi (once known as Barbourofelis osborni) shared this place with the cougar-size cat Pseudaelurus. Dogs were by far the most diverse carnivores, with small fox and coyote-like dogs living in the shadow of larger bone- crushing brutes like Borophagus and the giant Epicyon. Ten million years ago Red Rock Canyon was, for all intents and purposes, the African Savannah. Sounds like a hell of a place doesn’t it? Even more so once you get out there. It has some spectacular geology, I’d say on par with Barstow or maybe even John Day. Combine that with the picturesque Mojave Desert and you’ve got one of California’s most awesome state parks. I had seen the place once before a few years ago but it was just a quick stop on the way back from Death Valley. To see more of it was one of the reasons I went on this trip. The main reason of course was to see what clues to its past we could tease out of the ground. Like the trips I’ve taken with the San Bernardino County Museum several curators attended this trip. Chief among them (at least from my perspective) were retired curator Dave Whistler and current curator Xiaoming Wang. If you’re wondering why he sounds familiar, it’s because he was one of the guys who authored that kickass dog book a while back. Xiaoming was nice enough to give me a lift to the places where we prospected (and even nicer to put with my enthusiasm for the weekend). The guy Certainly knows his stuff. Dave Whistler was also a pleasure to talk to. As well as paleontology, the guy sure knows his way with desert plants (though it may just be these desert plants. Dr. Dave has been going out there a LONG time). So what exactly did we find? Not as much as previous trips according to people who have done this before (one guy said he didn’t like the first site). I myself found what I always find when searching for fossils: bupkis. 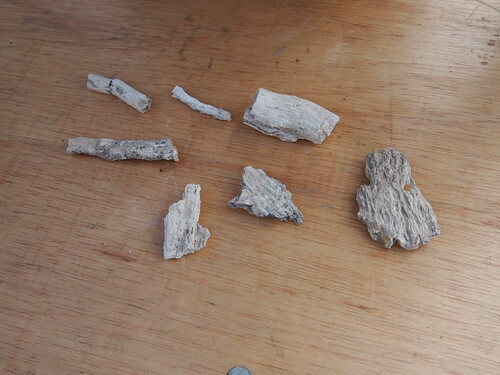 I found a few root casts, some petrified wood, and lots of little bone shards (who didn’t find those?). Other people had better luck. At the end of the trip our tally was: a distal camel femur, a distal camel humerus, part of a camel vertebrae, a Pliohippus tooth (I think. 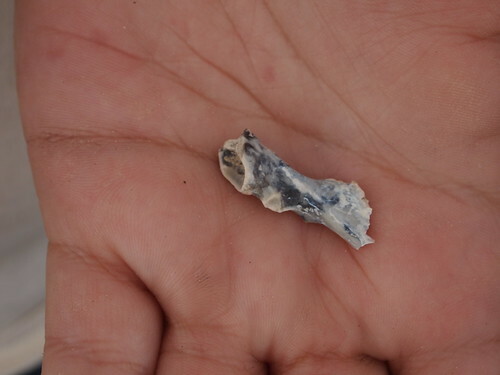 It was a horse tooth, I know that much), a camel ankle bone, a distal horse metapodial, fragments from a juvenile gomphothere tooth, and a little bit I called “Mr. Contentious” since they couldn’t agree on what it was (Dave thought it was part of the enamel band found on gomphothere tusks. Xiaoming and Gary thought it was a piece of rhino incisor). Before we had set out I foolishly proclaimed that my goal was to find one of those gnarly rhino teeth. Yeah, i put my crappy finds on the Table of Discoveries. I have depression! My self-confidence is practically non existent! I needed to feel like i accomplished something! So even if I didn’t find anything it was a very interesting and worthwhile trip. Learning about the paleontology and ecology of Red Rock Canyon was very interesting and I had a great time talking with the curators (current or otherwise). I will certainly go back next year (if anything to find that rhino tooth!). And maybe in the distant future I can do my own prospecting out there. Because this place is awesome. I wish to help tell its story anyway I can. 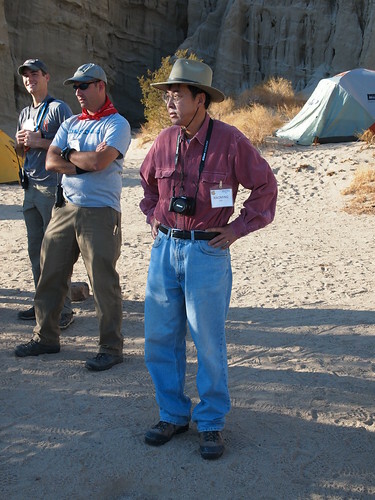 Thank you LA Museum for providing me an opportunity to search for fossils, thank you volunteers for covering all the logistics, and thank you Dave and Xiaoming for putting up with me! Again, apologies for the rants but we are back on track! I know I started this blog to talk about Central Coast fossils, but I realized that if I did, I would be out of material by July. But lucky for my readers, this blog also talks about stuff in the context of that unrealistic museum vision of mine. So that means we get to look at the places I hope to one day go to prospect for fossils (and there are a lot of places I’d like to look). 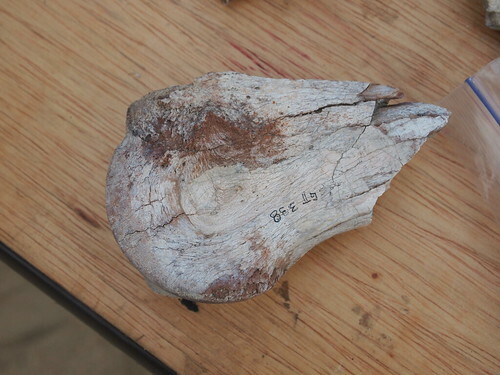 Lake Manix has yielded an abundance of fossils from the late Pleistocene. Most of the fossils come from the 100,000 year old layers at Basset Point. According to Eric, the American Museum found some stuff out here, but not much more work was done. Then in the 1960s a man named George T. Jefferson did a lot of work out here. He built up a collection of fossils at UC Riverside. Unfortunately the university eventually liquidated their fossil collection and most of the material was sent to UCMP (University of California Museum of Paleontology). Today, the San Bernardino County Museum goes on collecting forays at Lake Manix and part of our trip included looking for fossils. Many types of mammals have been found in the Manix beds including: a large horse, a small horse, three ground sloths (a rare occurrence), mammoth, large camel, llama, dire wolf, scimitar cat, and even short faced bear. No mastodon however. Interestingly, Eric told me, no mastodons have been found in the Mojave Desert. We found a couple other fossils which Eric thought were parts of vertebrae, probably from camels. Funnily enough, Eric has a little wish list for what he’d like to find: Smilodon and the lower jaw (with incisors) of a horse that died at the age of 6 or 7. Sorry for letting you down Eric. But hey, that’s just another reason to come back! Lake Manix was a great place to visit. We didn’t find any spectacular fossils (like the camel metapodial below) but we found fossils nonetheless. I certainly enjoyed seeing up close how fossils are actually collected. And until I can figure out where to go look for fossil, this experience was the closest I can get to that. But the trip to Lake Manix was a blast and offered some great scenery. Thanks Eric for another fantastic field trip.